A press conference was held at the CGS Klárov headquarters on Friday 19 September 2014, presenting field research activities in Antarctica. In the course of ten years, Czech geologists have been able to collect a vast number of unique fossilized remains of fauna and flora. 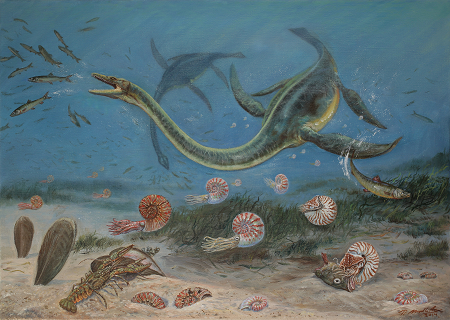 The most prominent discoveries presented to the public include the skeletal remnants of a large marine reptile Plesiosaurus, fossil shells of giant ammonoids and nautiloids or fossilized tree trunks. The participants of the Antarctica expeditions personally on the occasion of the 95th anniversary of the Czech Geological Survey’s foundation showed this collection of worldwide importance. News highlighting this event have appeared shortly in mass media. The conference was covered for instance by the Czech Radio reporter or by the Nova-TV and Czech-TV staffs.